The weather in Patagonia is notoriously fickle. Clear skies give way to thunderous downpours and vice versa. While spending a few days in the charming town of El Chalten in Argentina I was hoping for the latter. We’d seen rain, rain, and more rain. On this particular day the forecast showed the rain breaking up in the afternoon, and so I planned an overnight trip to Laguna Torre, one of the most famous spots in Los Glaciares National Park. 11 am came and the rain was till falling. Noon, and still the rain persisted. 1 pm, and the rain continued. Eventually I began to run out of daylight and so decided to start the hike regardless of the weather and packed up my backpack and camera equipment. I hit the trail exactly 2 hours before sunset with intermittent splatters of raining squelching down out of the sky. The hike to Laguna Torre is just about 9 km, or around 6 miles. I knew I could hike that distance in two hours but it would be a hustle. Thankfully the trail is relatively flat and at low elevation, which meant I could cruise. The more I hiked the more the clouds broke up, and about halfway along the trail I came to a vista which provided a dramatic view of Cerro Torre, one of the most iconic peaks in the world. The broken clouds allowed sunlight to filter through, creating a dreamlike atmosphere through which the peak poked its craggy head. After snapping a handful of shots I set off down the trail and did reach the lake before sunset. Though by that point the clouds had come in thicker and rain was once again falling. 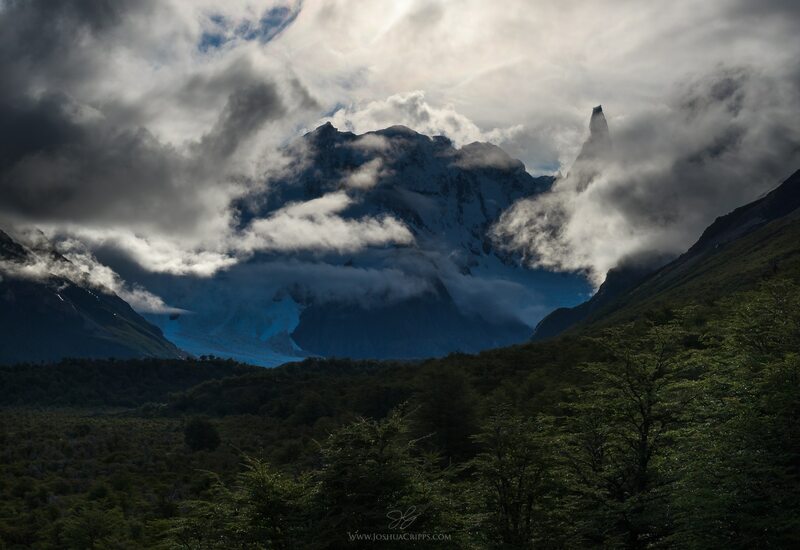 I didn’t see Cerro Torre for the rest of the trip, making me happy I’d stopped when it was rising from the clouds.